Today I’d like to share a trio of sparkly Easter home decor pieces I made. Inspired by the spring weather that brings longer days, sunny weather, bees, and butterflies buzzing in the air. Hello everyone, Asia King here! I can’t help feeling excited that spring is finally here! And so is Easter – have you finished your preparations yet? My Easter set includes decorated Styrofoam eggs, a wooden frame, and a candle. The frame was covered with designer papers using Crafty Power Tape. 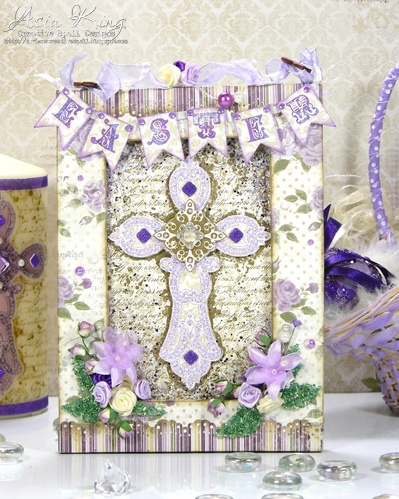 I added some scalloped panels cut with an edge punch and a stamped Easter banner using 3D Foam Pennants. For the insert, I stamped the Baroque Cross stamp twice with Coffee ink. First image was for my background and the second was used to cut out the orate centre. Next I stamped the image with a clear embossing ink and heat embossed it with the lilac embossing powder. Then I fussy cut the cross and arranged the layers over Thin 3D Foam Squares White Mix. I also added some Foam Squares decorated with Micro Glitter. 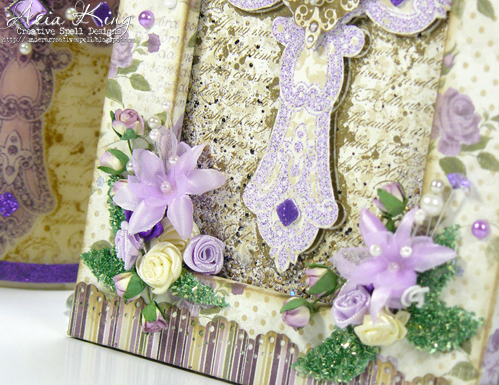 The corners of the insert panel were embellished with embossing powders and glitters using encrusted jewel technique. My flower sprays were attached using Adhesive Dots 3D and Adhesive Dots Medium. I also added 3D Foam Leaves decorated with the green glass glitter. 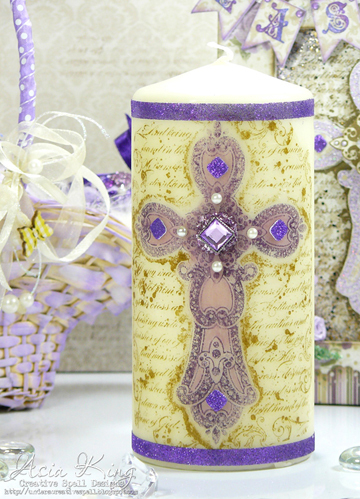 To decorate the candle I stamped the cross onto tissue paper which I melted into the candle with a heat tool. I embellished it further with glittered Thin Foam Squares Mix White and Crafty Power Tape. 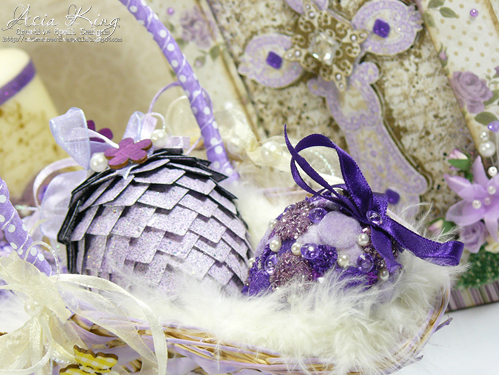 My Styrofoam eggs were decorated with lilac embossed Creative Photo Corners – White, embossed & glittered 3D Foam Squares Regular White and flocked & glittered Adhesive Dots Small, Adhesive Dots Medium and Adhesive Dots 3D. To finish the eggs I added some ribbons and decorative pins and I placed them in a fluffy posy basket. 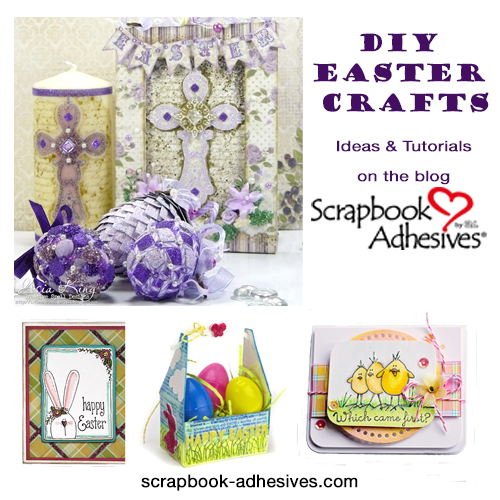 For more Easter project inspiration, click: DIY Easter Crafts on Parade. Thanks for visiting. Have a wonderful and creative week! 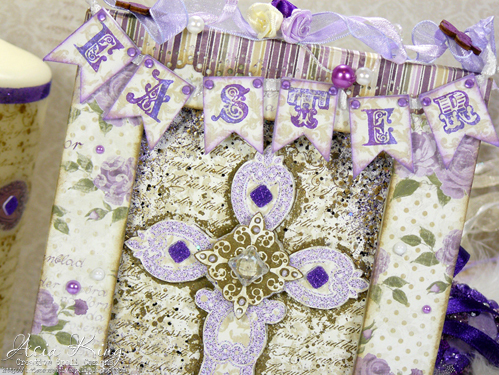 Stampendous: Cling Baroque Cross and Big Top Type clear stamps, Fran-tage Encrusted Jewel Kit – Purple, Purple Micro Glitter, Fresh Green Crushed Glass Glitter, purple fun flock. Maja Design papers Fika collection, Martha Stewart Doily Lace Edge Punch, Coffee Archival, Vintage Photo and Dusty Concord distress inks (Ranger Ink), wooden picture frame, ivory candle, ribbons, fabric flowers, gems. 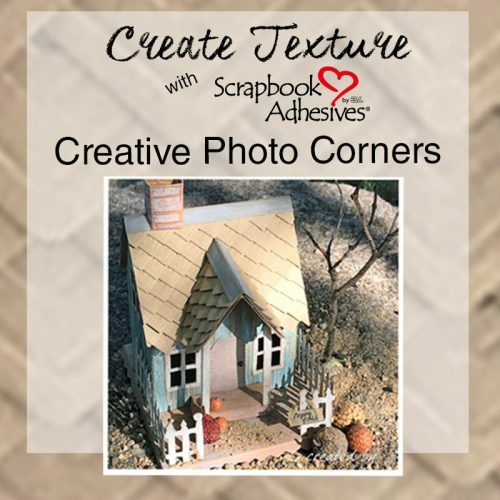 This entry was posted in 3D Foam Shapes, 3D Foam Squares, 3D Projects, Adhesive Dots & Lines, Adhesives, Altered Art, Crafts & Tutorials, Crafty Power Tape, Creative Photo Corners, Gifts, Home Decor, Permanent Adhesive, Seasonal Craft Ideas, Spring, Wear your Adhesive on the Outside and tagged 3D Foam Leaves, 3D Foam Pennants, 3D Foam Squares Regular White, Adhesive Dots 3D, Adhesive Dots Medium, Adhesive Dots Small, Altered Project, Asia King, Crafty Power Tape 81' Dispenser, Creative Photo Corners White, Easter, Flowers, Frame, Glitter, Home Decor, Maja Design, Martha Stewart Crafts, Ranger Ink, Stampendous, Thin 3D Foam Squares White, Wear Your Adhesive on the Outside. Bookmark the permalink. 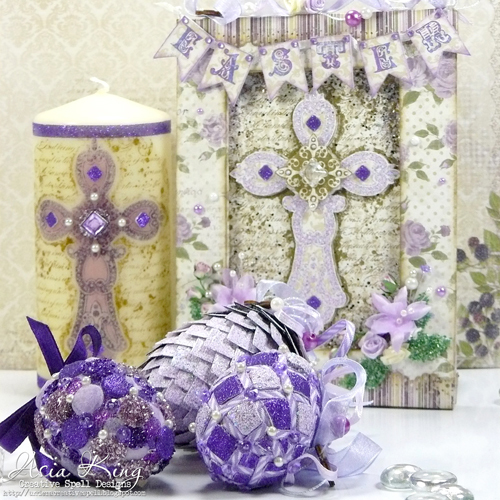 2 Responses to "Easter Trio Home Decoration"
Wow these projects are gorgeous they could be displayed in your home or given as gifts either way they are perfect! Gorgeous projects Asia!!! Love the dimension, colors and beautiful attention to detail.